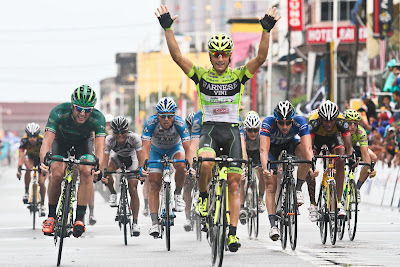 3 March 2012, KUALA TERENGGANU - If yesterday saw him equal the record of nine stage wins in the Tour de Langkawi, today was the moment when Andrea Guardini moved clear of the rider who previously set that mark, Graeme Brown. The Italian sprinter was quickest in the big gallop into Kuala Terengganu, getting the better of Matteo Pelucchi (Team Europcar), Raymond Kreder (Garmin Barracuda), Jacobe Keough (UnitedHealthcare) and others. 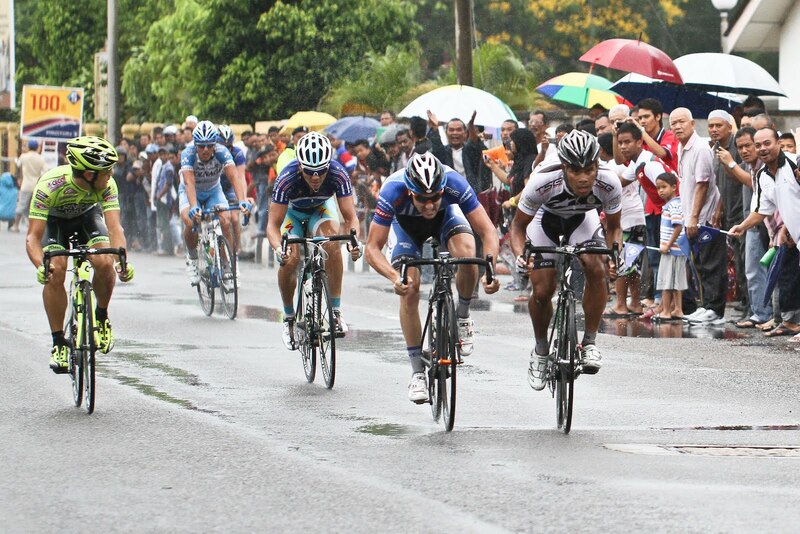 The sprint was conducted by a smaller group than usual due to a big pileup inside the final three kilometres. 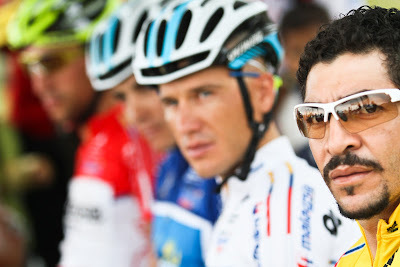 Many riders were delayed, including race leader Jose Serpa (Androni Giocattoli – Venezuala), but a UCI rule pertaining to such incidents saw those riders given the same time as the winner Guardini. Serpa was fortunate that the big crash happened when it did and not earlier; had it been outside the three kilometre mark, he would have lost time to some riders. 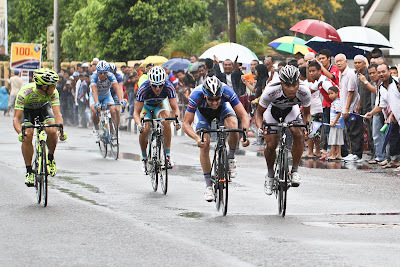 That said, his main rivals Jose Rujano (Androni Giocattoli – Venezuala) and Victor Nino Corridor (Azad University) were also in the delayed group, and so the situation would not have been too dangerous. A bigger moment of panic came earlier in the stage when the fourth-placed rider Alexandr Dyachenko (Astana) got clear in a break. The move was closed down by the bunch, but it was the biggest move by one of Serpa’s challengers since the Genting Highland stage. Afterwards, Dyachenko said that he was thinking more of the points classification and his team-mate Valentin Iglinskiy’s attempts to beat Guardini there. However Iglinskiy suffered a setback today in that Guardini re-took the blue jersey of points leader. The two ended the day locked on points, but the Italian’s better stage placings gave him the edge. He recouped the points he was behind by finishing one place ahead of Iglinskiy in the first intermediate sprint, then placing first to his sixth in the final gallop. He then didn’t have to sprint in the two remaining intermediate gallops as four riders broke clear and soaked up those points. They were Garmin Barracuda’s Nathan Haas, David McCann (RTS Racing Team), former race winner Anthony Charteau (Europcar) and Reinardt Janse Van Rensburg (MTN Qhubeka). The quartet opened up a gap of over two minutes but were eventually reeled in with approximately four kilometres to go. That last stage covers 114.8 kilometres from Tasik Kenyir to Kuala Terenggannu. It is devoid of any categorized climbs and a big gallop is once again the most likely outcome. Guardini will be excited by that, and could further extend his stage winning record. Another overcast day awaited the riders at the start of the penultimate stage of Le Tour de Langkawi, with those clouds turning to heavy rain very soon after the start in Kemasik. 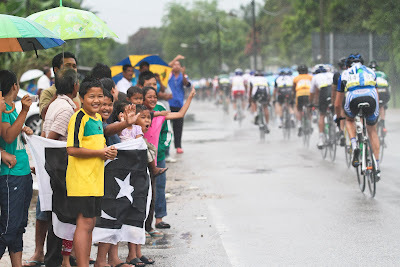 Multiple attacks were fired off before the first intermediate sprint in Dungun, 38.9 kilometres after the start, but nothing remained clear for long.